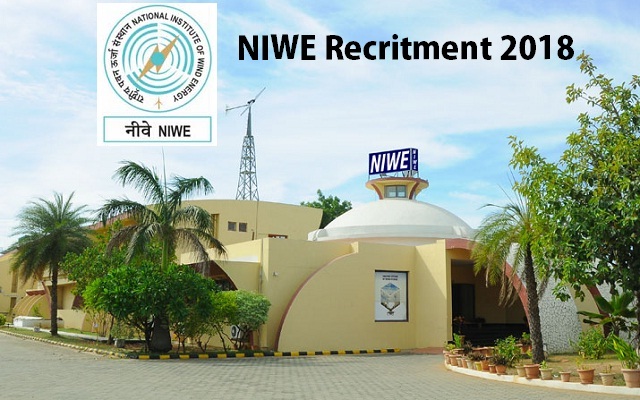 NIWE Chennai Recruitment 2018-2019 Application Form for 13 Junior Executive Assistant, Junior Engineer, Project Officer, Project Engineer Posts Download Application through Official website http://niwe.res.in. NIWE Chennai JE, JEA Jobs Notification 2018 Released. The Interested and Eligible Candidates are requested to Download Application through Official website http://niwe.res.in. The last date for submission of applications is 28.03.2018. NIWE Chennai Recruitment 2018-13 JE, JEA Posts - Apply Online. Junior Executive Assistant - Passed 10+2 from a recognized Board/ Institution. Passed 80/30 w.p.m. in Shorthand / English Typewriting - Proficiency in MS Office. Hard Copies of the signed application (registered online) along with photocopies of (i) ID proof (ii) Proof of Date of Birth (iii) Educational Certificates: Mark-Sheets/Degree Certificate (iv) Caste and attested copies of relevant documents should be addressed to “The Deputy Director General (F&A), Velachery - Tambaram Main Road, Pallikaranai, Chennai--600100” by post so as to reach us by 28.03.2018.